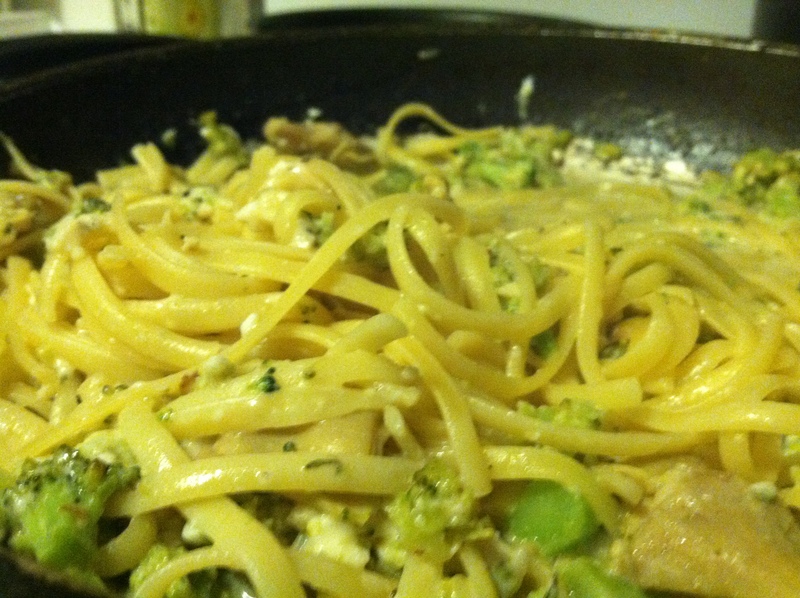 I call this Accidental Alfredo because I literally didn’t realize what I was making until after it was made. I had taken a recipe, modified it because I refused to go out and find all of the ingredients, tasted it, and finally realized what this one guy was talking about when he said Alfredo sauce was just fat, cream, and cheese. The beauty of this sauce is that you don’t have to add the artichokes and broccolis if you don’t want it, just consider it a suggestion. Feel free to experiment by adding roasted chicken or what have you to the mix. Cook the linguine according to the instructions on the box. As the noodles are cooking, whisk the yolk in a medium bowl while gradually adding the lemon juice and cream. Once the noodles are complete, drain the pasta but save 1 C of the liquid and add it to the yolk mix. If you’re like me and you simply bought frozen broccoli, place the broccoli and the artichoke with the oil into a pan and sauté. After the broccoli either is unfrozen or turns a bright shade of green, drain any excess liquid and add in the garlic and artichokes, tossing the mix for a few minutes. Add in the yolk mixture, cheese and parsley to the pan. Keep stirring until the sauce thickens. Add noodles and toss until they are well coated. PS, don’t go crazy on the lemon! The second time I made this, the lemon overpowered everything.